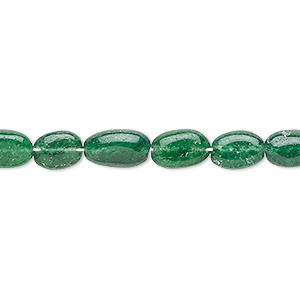 Bead, peridot (natural), 6x5mm-8x6mm hand-cut flat oval, D grade, Mohs hardness 6-1/2 to 7. Sold per 13-inch strand. Item Number: H20-9707SK Have a question about this item? 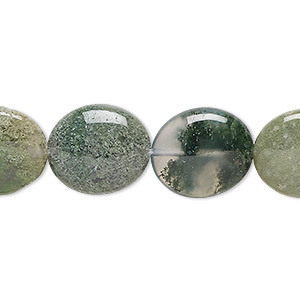 Lively green hues with transparent to opaque translucencies add a bright touch to jewelry designs. 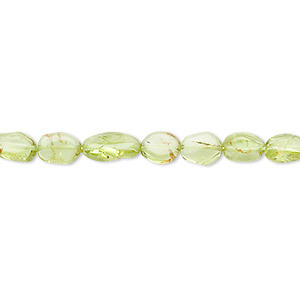 Known for its warm and friendly energy and sought after for its eye-catching color, peridot is a favorite among jewelry designers and customers. Sizes, shapes and colors may vary with handcrafted items. 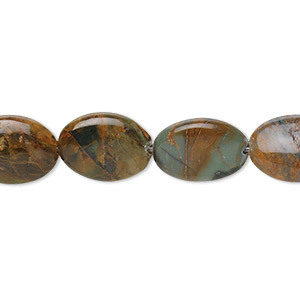 Bead, moss agate (natural), 14x12mm flat oval, B grade, Mohs hardness 6-1/2 to 7. Sold per 15-1/2" to 16" strand. 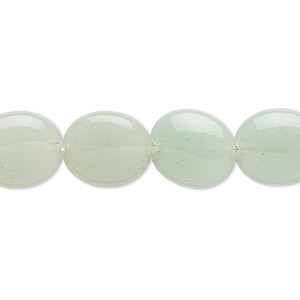 Bead, green "opal" (chalcedony) (natural), 14x10mm flat oval with 0.5-1.5mm hole, B grade, Mohs hardness 5 to 6-1/2. Sold per 15-1/2" to 16" strand. 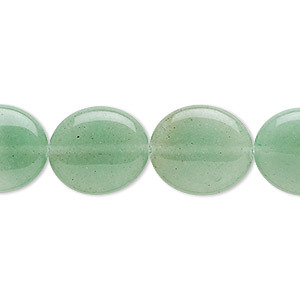 Bead, green aventurine (natural), light to medium, 14x12mm flat oval, B grade, Mohs hardness 7. Sold per 16-inch strand. 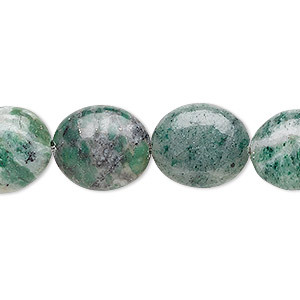 Bead, emerald green aventurine (natural), 6x5mm-8x6mm flat oval, B grade, Mohs hardness 7. Sold per 15-1/2" to 16" strand. 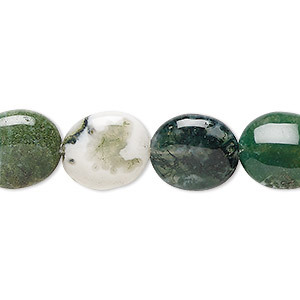 Bead, moss agate (natural), 16x14mm flat oval, B grade, Mohs hardness 6-1/2 to 7. Sold per 15-1/2" to 16" strand. 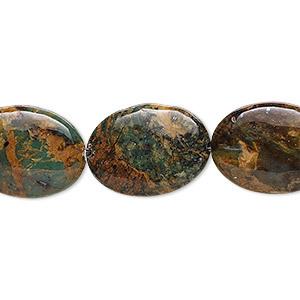 Bead, Ching Hai "jade" (dolomite and fuchsite) (natural), 14x12mm flat oval with 0.5-1.5mm hole, B grade, Mohs hardness 3-1/2 to 4. Sold per 15-1/2" to 16" strand. 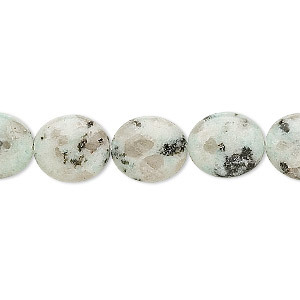 Bead, African "jade" (quartz) (natural), 16x14mm flat oval with 0.5-1.5mm hole, B grade, Mohs hardness 7. Sold per 15-1/2" to 16" strand. 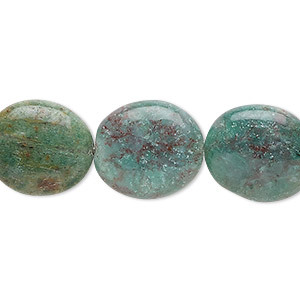 Bead, green aventurine (natural), light to medium, 16x14mm flat oval, B grade, Mohs hardness 7. Sold per 15-1/2" to 16" strand.